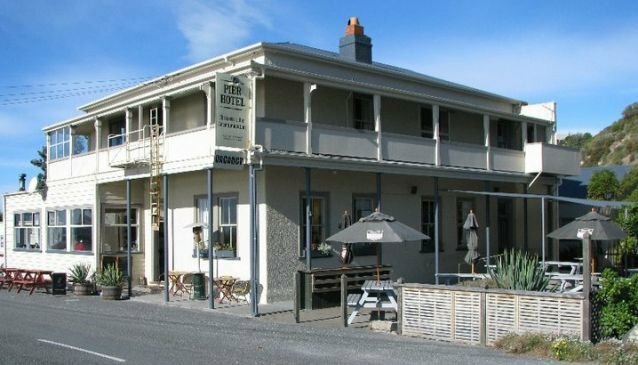 The Pier Hotel Kaikoura is a working hotel, restaurant and bar, in the old, traditional Victorian style. The Pier's restaurant specialises in local seafood, especially crayfish, and the menu has been described as 'Pacific Rim Gastropub'. The Pier Restaurant's wine menu is extensive, and is best enjoyed in front of the roaring fire against the nostalgic backdrop of sepia Victorian photographs of the area, which hang on the walls. The restaurant is open for both lunch and dinner service. The bar is a popular local haunt, much as it would have been 120 years ago, with some great beers and spirits. The Pier Hotel, B & B accommodation, restaurant and bar at Kaikoura, New Zealand. An historic hotel with modern amenities, The Pier Hotel was first built in circa 1885. This cozy seaside hotel still retains the appearance, charm and atmosphere of yesteryear - but houses all the mod cons of today! A thorough refurbishment complements the old with the new. The site is superb and undoubtedly the best outlook in Kaikoura, with panoramic vistas of the Kaikoura Ranges and sweeping views of Ingals’ Bay from the bar, balcony and restaurant . Come and see for yourself.